Early resection is standard of care for presumed low-grade gliomas. This is based on studies including only tumors that were post-surgically confirmed as low-grade glioma. Unfortunately this does not represent the clinicians’ situation wherein he/she has to deal with a lesion on MRI that is suspect for low-grade glioma (i.e. without prior knowledge on the histological diagnosis). We therefore aimed to determine the optimal initial strategy for patients with a lesion suspect for low-grade glioma, but not histologically proven yet. 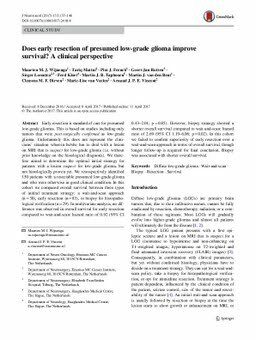 We retrospectively identified 150 patients with a resectable presumed low-grade-glioma and who were otherwise in good clinical condition. In this cohort we compared overall survival between three types of initital treatment strategy: a wait-and-scan approach (n = 38), early resection (n = 83), or biopsy for histopathological verification (n = 29). In multivariate analysis, no difference was observed in overall survival for early resection compared to wait-and-scan: hazard ratio of 0.92 (95% CI 0.43–2.01; p = 0.85). However, biopsy strategy showed a shorter overall survival compared to wait-and-scan: hazard ratio of 2.69 (95% CI 1.19–6.06; p = 0.02). In this cohort we failed to confirm superiority of early resection over a wait-and-scan approach in terms of overall survival, though longer follow-up is required for final conclusion. Biopsy was associated with shorter overall survival.